Baja Trek - Baja Vibe School Bus Trips! To be earth friendly the Beach Bus runs on recycled waste vegetable oil (WVO) to motor down the road. We'll share most of our healthy meals and have the option of sleeping on the bus or low-impact tent camping to cut costs and maximize time. The adventure starts at the Baja border at our special meeting spot. No two Baja California road trips are the same but one thing is certain- you'll experience relaxed travel with warmhearted people in a Baja hostel on wheels. 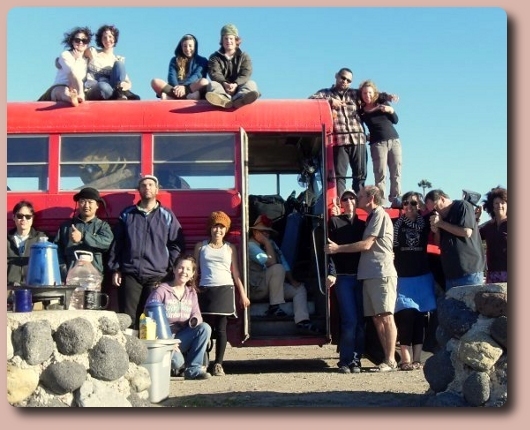 Experience the Baja Vibe on the earth friendly Baja Beach Bus Hostel on Wheels. The Baja Vibe style of seeing Baja is about people, places and new friends made from all over the world. Our concept is simple: take a retro-fitted bus, convert it to be an environmentally friendly Baja hostel on wheels, put in a few interesting people and explore Baja California Mexico. It's a recipe for a great Baja adventure. If you like no-frills unscripted adventure into unique places and sharing those experiences with new friends, then a Baja Vibe style of a rolling hostel is for you. In the Baja Beach Bus you'll travel more as a local than as a tourist. A rolling hostel is a little out of the ordinary and allows us to get to remote places not normally accessible by big commercialized tour buses.